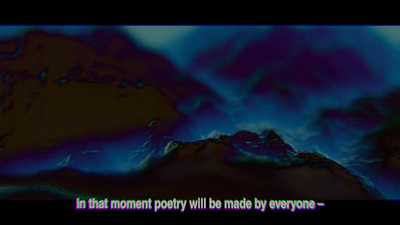 Lovely visuals, trash audio in the right way, cool "poetry", awesome vibe. Had lots of technical issues tho; for example, I ran the 1080p version, got fullscreen 4k, and the demo just rendered to the top-left 1080p portion of the screen. Also it crashed on exit. also out of curiosity, what was used in OpenFrameworks here? Looks like the standard "raymarch stuff with noise" and post affair; didn't you guys have that covered in your previous tech, or was this used as different "packing" just to try stuff out? Both issues are known. OpenFrameworks doesn't seem to provide a straightforward way to set up a proper fullscreen screenmode, at least according to the documentation. I knew about the segfault in the end too, didn't care enough to fix but I'll take care of that too in a final hopefully. This is... different, it somehow manages to transport its message unexpectedly well -> thumb. Only thing I'm wondering is, why is it so large? text went too fast to read for me but got gist of it. lj: no good reason really, just a lot of unnecessary OF components compiled into the exe... certainly could be a lot smaller but it wasn't a priority. Brutal. I actually think the fact it crashes on exit is fitting, it's like the program got so fucked up it couldn't even run anymore. effects are great, sync is great, noise is great, pretty good demo overall. not everyones cup of tea for sure but who cares :D well done! Wow, this was brutal. Loved it, except for green being too much of a coder colour for me. Wished it would come into focus at the end, but then again, you only come into focus if you've got a visual equivalent of an ace up your sleeve, and it is a kind of thing that's usually nearly impossible to come up with on a short notice. It knows what it wants to be and does it well, the lyrics made me curious instead of cringe so i guess they work as well. Also, while im very accessible by glitch prods, the sound got annoying after some time because it misses variation in the middle part - but I see what you did here. Maybe not my favourite prod by epoch but I'd give a thumb for the fake-stuttering in the glitches alone. Whereas EMIX had a wonderful synergy of form and glitch, where it was never quite possible to tell where one ends and the other begins, this one has a quite clear and noticeable distinction about which is which. As such, the result doesn't seem nearly as technically intricate, and a lot of time the destruction just seems like an afterthought. So for me, this is "a simple demo with glitch on top". quite nice noise-glitch stuff done properly... last ~30 seconds kinda lack exciting sync tho. Insert mandatory "I liked the part where it glitched" meme here. Massive. Keep the segfault on exit, it is perfect. Noise demos can be entertaining. This one wasn't. Loved the visuals! The subtitles were a nice touch as well. The soundtrack was too harsh for my taste though, had to tune out about halfway. Noise demos can be entertaining. This one wasn't. But I didn't come here for entertainment. I liked the glitches and the demo in generally but I have to agree with urs on the direction things. However, taking the time constraints into consideration, it's awesome! Oh boy this was intense. At first I was kind of disappointed by the direction it took after the intro part, but it grew a lot on me as it progressed. I think this is one of the productions that will improve with time. not my cup of tea at all. oink. Pretty awsome! Could have been super stylish and smooth, , but ended up with a tremendous attitude instead. It worked for me! I'll shed some light on what this demo is about. I'm not surprised it's not immediately obvious. The demo has two juxtaposed themes, one of which is the meta level and the other visceral primal rage. Really the demo was originally supposed consist only of this pure catharsis. The catharsis in this case comes forth not so much via being emotionally demanding but by mere sensory assault. In the end the catharsis became mostly secondary though, because I decided to incorporate a brief summation of my thoughts regarding expression and cultural relativism using intertextuality as a method, something that is overlooked in demos I feel. This is of course done via the quotation from the film Sans Soleil, which essentially—to me anyway—says something about empathy regarding different means of expression and appreciating such diversity (even if it's not your "taste"). "Emus in the zone" as expressed in Sans Soleil is a concept that at face value is absurd, but can still carry meaning in some contexts. The "noise" in this demo—like all art—is similarly meaningless at face value, but can still elicit an emotional reaction in the viewer. Though the question "what is a demo?" consistently comes up in discussions within the scene, there's much more room for philosophical ideas within demos themselves. The catharsis in this demo doesn't carry any deeper meaning, not as intended anyway. It's merely an exercise in an aesthetical style that appeals to me, i.e. the "Emu in the 'zone'". So does my language touch you? Either answer is fine to me. I didn't expect most people to like this at all, but apparently a few were quite affected by it, which is more than enough for me. Quotes from Sans Soleil set up good mood. make you think about meaning. I like it. almost a thumb up from me, but... 12.8mb? imerso: The exe contains a lot of the OF libraries, too much even. Assuming I could recreate the track (not that hard) in a small synth I'm pretty certain this could be an 8k. I had no time resources for size coding though, nor did I really care to this time around. well that was intense. what urs said. I've enjoyed some Epoch noise demos (e.g. EMIX) quite a lot, but this was a bit too much. The alternative approach to scene poetry was cool tho. excellent - love your style generally! Dope. Keep coming, I'll keep savoring.